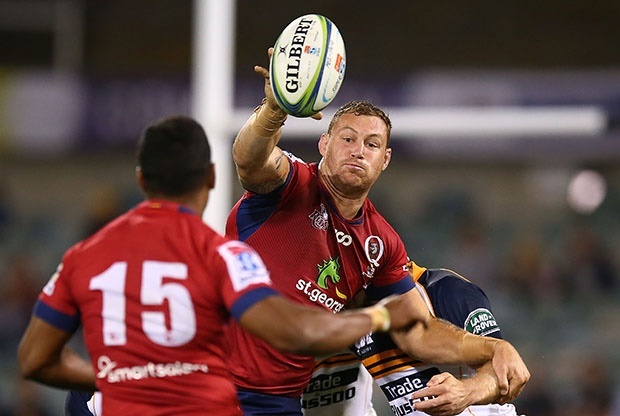 Brisbane - A revival by the Reds gathered pace on Sunday with their second win in a row, storming past a tired and outplayed the Brumbies 36-14 in energy-sapping conditions. The Brisbane-based team crashed to defeat in their opening three Super Rugby games, but stunned the Sunwolves in Tokyo last weekend with a gritty 34-31 win and dominated the Brumbies. Scott Higginbotham, Chris Feauai-Sautia, Tate McDermott, Brandon Paenga-Amosa and Bryce Hegarty all scored tries for a bonus-point victory. It was testament to their fitness levels in a game played in stifling 34 Celsius (93 Fahrenheit) heat and high humidity that saw the Brumbies flag in the second half. "Really pleased with how we started, it's something we've been working on for the past few weeks," said dynamic Reds skipper Samu Kerevi. "Really proud of the boys," he added, saying their "intent" throughout the entire 80 minutes was what pleased him most. Brumbies captain Christian Lealiifano admitted his team deserved to lose. "They came with a lot of energy and probably beat us in the physicality area. We're disappointed but we'll go away and look at that and look to improve," he said. The Brumbies opened with a period of intense pressure with virtually the entire first 10 minutes played in the Reds' half, including an epic 27-phase play from the hooter. But the home team's defence was rock solid and they soon took the attack to their Canberra rivals, with Higginbotham wriggling his way over the line from a ruck five metres out to open the scoring. It was the ever-reliable number eight's 39th Super Rugby try, extending his own record as most ever by a forward. Hegarty slotted the conversion, then a penalty as the Reds began to dominate, going into half-time with a 10-0 lead in front of Wallabies coach Michael Cheika. Seemingly revived by the break, the Brumbies quickly worked the ball to the Reds' 22 before sending it out wide to Henry Speight who crashed over, with Lealiifano nailing the conversion. But it was a futile effort with two quick Reds tries reasserting their authority. For the first, Kerevi beat a Brumbies defender on the sideline and as space opened up offloaded to Feauai-Sautia who ran unchallenged to the line. Feauai-Sautia was at the heart of the next, picking up a loose ball and passing to McDermott who sprinted from the half-way line. Debutant Jahrome Brown pulled one back for the Brumbies barely 20 seconds after coming on before Hegarty got the Reds fourth with a long-distance run and Paenga-Amosa put the final nail in their coffin on the siren.